Theatre Aficionado at Large – As it was at the overture and shall be at the exit music, bliss without end. Amen. Same as every other year: each film was watched in its entirety. All films that I’d never seen before have been marked with an asterisk. A few years ago, I made a conscious decision to keep a log of the musical theatre-related albums I listened to *in their entirety* throughout the calendar year. With a couple of exceptions, almost every recording is linked to its own page on castalbums.org (a site I highly recommend for serious collectors of theatre music). An asterisk indicates a recording I listened to for the first time. A couple years ago I realized that shuffle made it easier for me to have my own portable radio but made me less likely to listen to complete albums. Around this time, I made a conscious decision to keep a log of the musical theatre-related albums I listened to in their entirety throughout the calendar year. Each recording is linked to its own page on castalbums.org (a site I highly recommend for serious collectors of theatre music). An asterisk indicates a recording I listened to for the first time. Last year, I made the conscious decision to keep a log of the albums (cast recordings, movie musical soundtracks, solo albums, live concert recordings, etc) that I listened to in their entirety. I decided to do it again in 2016. Each recording is linked to its own page on castalbums.org (a site I highly recommend for serious collectors of theatre music). An asterisk indicates a recording I listened to for the first time). I’ve done a lot of interesting things as a result of writing this blog. I’ve been interviewed by major newspapers and I’ve been seen on videos for Stage Rush and Patty and Emily, but until this past week I had never been on a podcast. My friend Kevin David Thomas his collaborator Robert W. Schneider invited me to be a guest on their essential podcast Behind the Curtain to celebrate the theatre luminaries we lost in 2016. Or on iTunes, where you can also subscribe and rate. 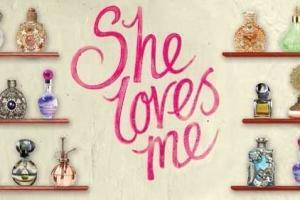 “My kingdom for a revival of She Loves Me!” is a thing I once tweeted. I fell in love with the original Broadway cast recording in high school, but it would be years before I would get to see it onstage. That chance arrived in 2013, when Ted Sterling presented a 50th anniversary concert at Caramoor. Cut to 2016. Exactly four years to the day after sending out this desperate missive, I was at the fourth preview of an enchanting revival at the Menier Chocolate Factory (and the second major production I’d seen this year). She Loves Me has never become a household title, though it remains a cult favorite. Its original production was eclipsed by flashy blockbusters like Hello, Dolly! and Funny Girl, running only nine months in spite of good notices and direction by Harold Prince. Every subsequent high-profile production has either been a financial failure or a limited engagement at a non-profit theatre. My hat is off to director Matthew White, who pitches his production at a perfect pace. First and foremost, he trusts the material (even if saddled with the mostly-inferior 1993 revisions). He emphasizes the humanity of these characters, with profoundly funny and moving results. Secondly, his focus never strays far from the economic and political uncertainty of 1930s Europe. Finally, he uses the space with such economy and invention that it becomes impossible to resist the show’s intoxicating charms. Mark Umbers and Scarlett Strallen play the feuding co-workers and would-be lovers. These two don’t just bicker, they hurl insults at each other like grenades. Their chemistry is sublime; combusting with euphoria in the one-two punch of “Vanilla Ice Cream” and “She Loves Me” in the second act. Umbers is immensely likable as the bookish and shy clerk, bringing out colors in the text that I’d never noticed before. Strallen, blessed with a lovely soprano, gives what feels like a close approximation of what Julie Andrews might have done with the part. Katherine Kingsley is quite simply the best Ilona I’ve ever seen, combining expert comic timing with pathos. Kingsley’s real-life husband Dominic Tighe plays her Kodaly, the likable cad. They have a playfulness that most paired in the roles don’t have, and Tighe’s “Grand Knowing You” is an absolute riot. Alistair Brookshaw puts a new spin on weary, reliable Sipos, whose neuroses over job security wreak havoc on Georg’s life. Cory English plays the haughty head waiter with a mix of droll comedy and surprising warmth. Callum Howells is an endearing Arpad (and has the most charming Welsh accent) and Les Dennis (Mr. Maraczek) is particularly moving in his “Days Gone By” reprise. A favorite among the game ensemble: Aimee Hodnett. Ms. Hodnett’s nosy shop customer lived for the workplace drama at Maraczek’s, and I lived for the grace notes she was adding on the periphery. Jason Carr’s new orchestrations sound better than the synth-heavy charts used in 1993. MTI should consider licensing his treatment for school, amateur and chamber productions. Catherine Jayes leads the band and conducts the show with sensitivity and depth. Paul Farnsworth’s jewel box of a set effectively uses four small turntables for transitions in and out of the shop. Farnsworth’s costumes are even better: his attention to period and character is beyond reproach. 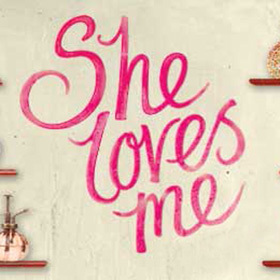 She Loves Me runs at the Menier Chocolate Factory through March 4. No word yet on whether or not there will be a West End transfer. To the powers that be, I can only say: Don’t let it end, dear friends. Late in the second act of The Light in the Piazza, Margaret Johnson tells Signor Naccarelli “There is no survey of the facts like time.” He doesn’t understand what she means, but in the years since the show’s premiere I’ve come to appreciate what she was saying. Piazza opened on Broadway at Lincoln Center Theater on Monday, April 18 2005. I was in the house that night and fell hard and fast for a complex, character-driven musical for grownups. I’ve never had quite so visceral a reaction to any other show before or since. The musical garnered favorable notices, and went on to win a whopping six Tony Awards (out of 11 nominations), extending its limited engagement four times, and airing as part of Live from Lincoln Center on PBS. Time has proven kind to the show. There have been many regional productions, the cast album is popular among musical theatre fans, and songs from the score are being sung to death in classes and auditions everywhere. I first took notice of The Light in the Piazza in early 2003, when I saw a news article announcing that Victoria Clark had been cast for the world premiere at Seattle’s Intiman Theatre. Unlike most 19 year olds, I was familiar with the 1962 film adaptation of Elizabeth Spencer’s novella (because of its star Olivia de Havilland). The story involves Margaret Johnson, a wealthy southern matron and her beautiful daughter Clara, who are vacationing in 1950s Florence, Italy. Clara was injured in a childhood accident involving a Shetland pony, leaving her mentally and emotionally stunted. When love blooms between Clara and the handsome Fabrizio, Margaret steps in to try and stop them. My friend Noah Himmelstein attended one of the early Broadway previews and called me afterward to tell me I had to see it. He told me I should sign up for the LCT student rush program and insisted I avoid any samples of music or preview clips before seeing it. I was staggered when I was able to score a $20 to the show’s opening night (my first). My professors excused me from all my classes that day, and I decided to spend my afternoon roaming about midtown, before heading to the Beaumont Theatre (another first for me). I people-watched in the lobby as John Lithgow, Helen Hunt and Maggie Gyllenhaal walked by until it was time to settle in to my rear loge seat. As for Adam Guettel’s score, it was love at first measure. The moment I heard that first harp gliss, I knew deep inside that I was going to love what I was about to hear. My most vivid memories of opening night are the rousing ovation Victoria Clark received for “Dividing Day,” observing the pair next to me clutching each other and weeping as Kelli O’Hara sang the title song, and how the applause would not subside until Adam Guettel, Craig Lucas and Bartlett Sher took a bow. My immediate reaction was to call Noah on my way out of the lobby, telling him it was the greatest musical I’d ever seen. He read me Eric Grode’s rave review from Broadway.com over the phone. When we hung up, I dreamily roamed about the plaza at Lincoln Center (almost bumping into Mike Nichols and Diane Sawyer). To say that the musical consumed my life would be an understatement. It was all I could talk about for the remainder of its run. I talked about the show at length with anyone who would listen (I’m still occasionally apologizing to my closest friends). I even bought the cast album the day before its official release at Colony Records, and it didn’t leave my CD player for five months. Then came the repeat attending. I was living in New Paltz, NY at the time, going to college and working at the campus library. Sundays were my day off so I would take an early Trailways bus into Manhattan, pick up at a ticket at TKTS and spend my afternoon being transported to 1953 Florence. I was at the final performances of Mark Harelik and Kelli O’Hara, the Live from Lincoln Center telecast and the highly emotional closing performance. 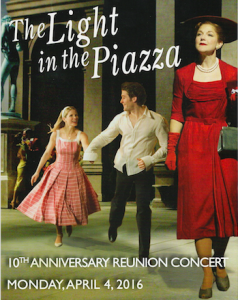 In all, I saw the original Broadway production of The Light in the Piazza twelve times. I only wish I had gone more. Before it was officially announced, I found out that there would be a 10th anniversary reunion concert when one of the cast members posted his regrets that he couldn’t be there. It took some sleuthing, but I was able to figure out that it was indeed happening in April at the Vivian Beaumont Theatre. (It’s actually the 11th anniversary, but that’s a minor point). The moment tickets went on sale, I tried to get LincTix but was told “We’re sorry there are no tickets available.” I tried again and got the same message. So I panicked and bought a full-price front row center seat in the loge. No regrets. Appearing in the concert were original cast members (in alphabetical order) Michael Berresse, Sarah Uriarte Berry, David Bonanno, Victoria Clark, Patti Cohenour, Beau Gravitte, Mark Harelik, Jennifer Hughes, Felicity LaFortune, Matthew Morrison, Kelli O’Hara, Adam Overett, Joseph Siravo, and Diane Sutherland. On the day of the concert I could hardly contain my excitement. I was doing something I never thought I’d get to do again: to hear this score sung by this cast in the same venue. As people gathered in the lobby I was flooded with so memories: people watching the first nighters by the understudy board, or trying the show’s signature cocktail on my 8th trip (it wasn’t great). I remember browsing through the cast albums at Tower Records or books at Barnes and Noble (both long gone), or just happily roaming the LC campus. Everywhere I looked the night of the concert, I saw friends, including some I had seen the show, the most poignant of all being Noah. The orchestra, led once again by Ted Sperling, was onstage, centered between upstage pillars of the massive set for The King and I. It was a delightful surprise to hear the complete overture, which was abridged during the show’s preview period (but recorded in its entirety for the cast album). The actors had chairs and music stands lined up towards the lip of the main stage area and performed the show mostly off-book in the thrust space. The cast was, if anything, better than they were ten years ago; deeper, richer. There was a magical combination of nostalgia and muscle memory. They hit similar marks from the original staging with just a few props. Certain line readings brought familiar laughs. They even went so far as to recreate the breathtaking hat trick that incites the love story. Victoria Clark, who won a Tony for the original production, is still a tremendous force as Margaret, the guarded, patrician mother. Her beautiful dramatic soprano is the perfect complement for the charming, complex woman she created years ago, and dare I say it, she looks even better now than she did then. The show has inexplicably never played London, and I think it’s time that both Piazza and Ms. Clark made their West End debuts. Kelli O’Hara was something of a revelation to me, which is a bit surprising considering I saw her in the original production seven times (and I thought her spectacular then). She was freer and funnier; more at ease with making Clara’s pain and confusion more layered and more deeply felt. Her soprano is in peak form and her upper register is flourishing. The evening showed just how much Ms. O’Hara has grown as an artist and a leading lady in the past decade. Her rendition of the title song was a bona fide showstopper, as though everything she had ever done in her entire career had built to that one flawless moment. When the lights came up, the person next to me, a total stranger, handed me a tissue without saying a word. It was a profound experience for me; one of the most personal of my life. I was overwhelmed by memories of a very happy, joyous time in my life and was glad to be able to share it with so many friends, old and new.